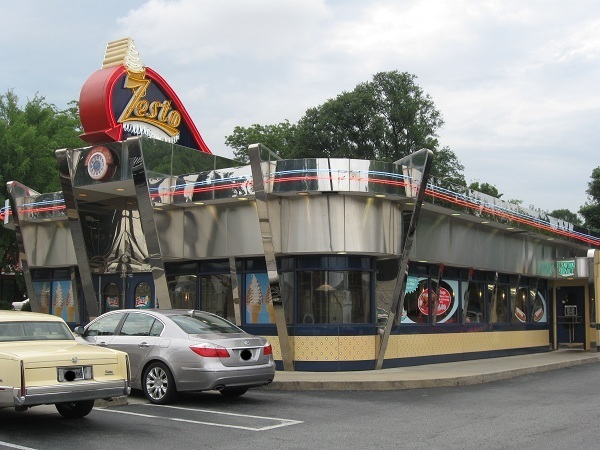 Zesto, Atlanta GA (CLOSED) – Marie, Let's Eat! I think that one of the most interesting little facets to following the world of restaurants is finding little fast food chains that only exist in a city or two. Last month, I mentioned Milo’s in Birmingham, a chain better known for its amazing sweet tea, and how it co-exists in north Alabama with another chain called Jack’s. Each of them manage to survive on the same interstate exits as the better-known national chains like McDonald’s and Burger King. I’m not saying you’ll get really great hamburgers at places like this, but I firmly believe that they’re important, that they give regions their own, special identity, and that anybody – traveler or resident – who’d stop at a national chain over a small regional one when they just want a quick $3.99 value meal has got a seven-inch screw loose somewhere. There are probably a lot more of these types of restaurants than anybody really knows about. Locals will often overlook them, mistakenly figuring that national success is a measure of quality, and treat these restaurants as oddball minor league wannabes. On the other hand, because the foodie subculture emphasizes (a) independently-owned single locations and (b) really great meals, regional chains only rarely come up in the conversations. They just don’t fit the topic, you might say. I noticed that in Asheville, there is at least one outlet of the Greensboro-based Cook Out, a chain 75 units strong that has not left the state of North Carolina. I’m very curious to try that one day, but honestly, can anybody count just how many superior meals we’d be skipping if we stopped into Cook Out over all the other really great places in Asheville? Similarly, Atlanta has at least two chains that nobody ever talks about. Neither will serve up spectacular meals, but they’ll do them quickly and cheaply and, hopefully, with a lot of local character. One of these days, I need to tell you about Martin’s, a chain of fifteen stores that’s only open for breakfast and lunch. Twelve of their stores are all northeast of the metro area and only one is as far south as Clayton County, and it tastes a lot like Hardee’s did before Carl’s Jr. bought them out. Martin’s basically illustrates my definition outside Atlanta’s I-285 perimeter, and Zesto is what I’m talking about inside the perimeter. To be strictly accurate, while Zesto, today, is a regional chain with six stores, back in the 1940s its ancestor corporation was about as large as a national chain could get in those days. According to the fascinating history on its web site, there were Zestos selling soft-serve ice cream in 46 states. I imagine that it and Tasti-Freez were the two biggest competitors to Dairy Queen. By 1955, the corporation and its franchises dissolved their agreements, leaving the stores to make it on their own. Almost all of the old Zestos were probably gone within a few years. There are still pockets of otherwise unrelated restaurants here and there throughout the country that use the old name but don’t offer the same menu or ingredients, including three around Columbia, South Carolina that appear to be uniquely owned, but the Zesto restaurants in Atlanta have thrived and grown a little. There are five Zestos in the city, plus with a more recent arrival in the teeny town of Tyrone, which is somewhere between Atlanta and Peachtree City, and each of them plays up the “1950s diner” experience. In the case of the store on Ponce de Leon, it really basks in the glow of nostalgic chrome and neon. The food is not at all bad, although nobody ever dropped their Chubby Decker back onto the wax paper in impressed shock at how amazing it was. There’s an amusing story about how the better-known Big Boy threatened to sue Zesto in 1961 over their imitation burger, named, then, a Fat Boy. I’ve always found Zesto’s burgers to be a little dry; adding a little slaw to a Chubby Decker really brings a refreshing flavor to it. Zesto flirted, for a time, with the “fresh-mex” concept when it became popular in the late ’90s. The restaurant did the unthinkable then and converted their location on Piedmont Road into a sister restaurant called Burrito Brothers. In time, this was scaled back, and now three of the six stores are discreetly “co-branded” this way, offering tacos and nachos on the menu along with the burgers and chicken. I have never got around to trying these, actually. I guess Zesto is just first in my mind as a burger place. 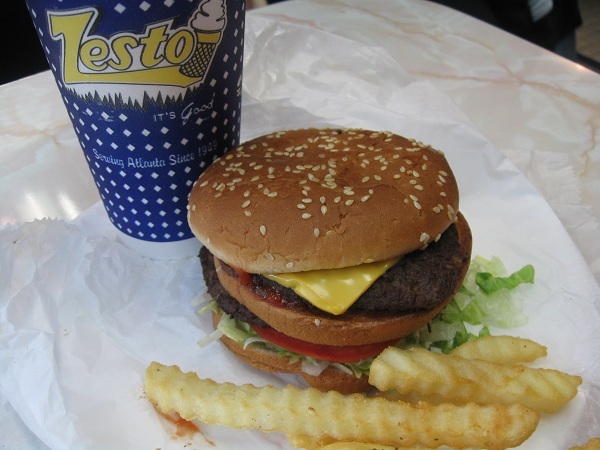 In Marie’s mind, however, Zesto is a milkshake place first and foremost, with burgers just an appetizer to the real thing. So a couple of weeks ago, my daughter had complained that we had not enjoyed a Zesto milkshake lately, and I said we’d get around to it. (Children, as ever, think parents are made of money.) On Saturday, Marie was due to return to Atlanta from her family business in the Netherlands around 7. I figured, rightly, that she was due some pampering after all those sky miles and would appreciate a chocolate banana malt, so the kids and I picked her up and stopped at the Zesto on Ponce for supper. I had a chili burger that dreamed of being a Varsity chili burger when it grew up and split an order of quite good chicken fingers with my daughter, and my son had a Chubby Decker and slaw. We all shared fries and heard about Marie’s trip and then we indulged in some quite good shakes. I usually either get the caramel or butterscotch, have trouble deciding between even these two simple choices, and have already forgotten which it was. My son had the blueberry, which was awesome. And Marie should have had a chocolate banana malt, only I forgot to ask them to add malt powder and I don’t think that she liked it as much, only she was too polite to mention it. It’s good to have her home. I mean, we have to go back to Asheville in two days for a festival and more eating, and her being in the Netherlands would make that kind of difficult. Posted on July 21, 2010 July 29, 2017 by Grant G.Posted in atlanta, burgers, georgia, goodbye, local chainsTagged atlanta, burgers, closed!, fast food, georgia, local chains, poncey-highlands. Sadly, the Ponce Zesto closed in September 2014. Pingback: The Colonel’s Mini-Mart, Henderson KY – Marie, Let's Eat! Pingback: Cardin’s Drive-In, Knoxville TN – Marie, Let's Eat!